Check Your Listing If You Have A Home For Sale In Tallahassee! If you have a home for sale in Tallahassee (or anywhere for that matter), you should check to make sure that your listing in the Tallahassee MLS is both accurate and complete. 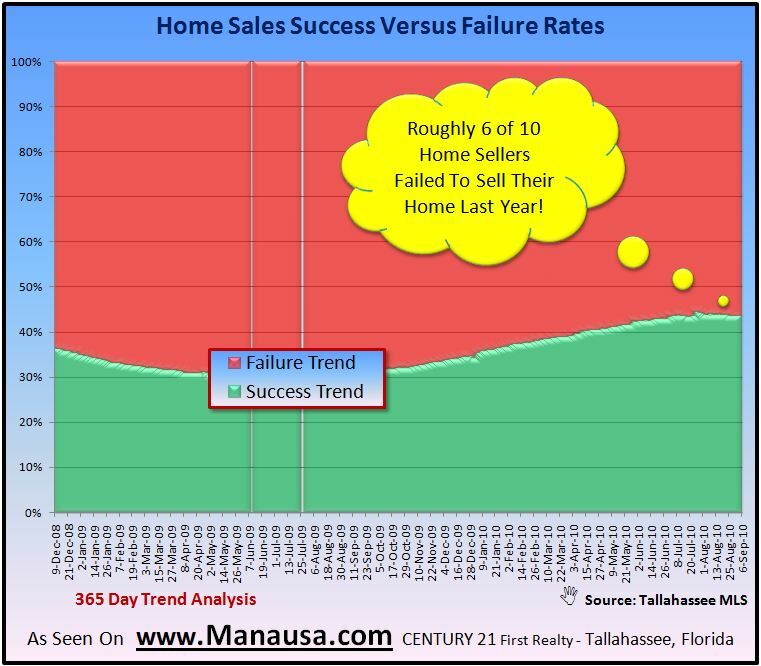 A review of the Tallahassee Board of REALTORS® Multiple Listing Service this morning showed that many "tricks of the trade" are not being utilized by all of the real estate companies in Tallahassee. I was prompted to do this check because recently a reader wrote in with a question about where to go to find information about creative financing and other options a home seller needs to consider in a market where roughly 60% of the listed homes fail to sell (see graph on right). This reader is about to list her property with us and wants to ensure that she employs every possible technique that she can to get the home sold. And it made me wonder. Do REALTORS in Tallahassee properly check all the key boxes when entering a home for sale in the Tallahassee MLS. You see, there are boxes that indicate whether or not the property is a short sale, whether it is bank owned, in foreclosure, or even if the Seller will assist in financing. All of these options open doors for buyers with margin credit or limited resources. While most home sellers would love to get cash at closing for their home, the fact is this market is requiring many to have to consider holding seller financing or even doing a delayed closing (lease purchase agreement). So many people are considering doing a lease purchase contract that four of our most popular blogs over the past few years have been on this very subject! Creative Home Selling – Taking A Lesson From Wall Street Using the zero coupon bond concept to help create more home buying and home selling opportunities. What Sellers Should Know About Lease Purchase Agreements While this creative tool can be beneficial to home sellers, there are correct techniques to consider and home owners need to understand the risks that they are taking. Creative Financing Offers Challenged Home Buyers Potential Solutions Many mortgage lenders are having to say “no” to challenged home buyers, but this technique can still result in a “yes” from some home sellers. Cautious Home Buyer Wants To Rent With An Option To Buy Home buyers who choose to rent a home before they actually close on it have to consider some very important issues when drafting the agreement with the home seller. So, if you have a home for sale in Tallahassee, make sure that your listing is complete and accurate. Make sure you mark that you will consider (some) level of owner financing and that a lease-purchase (for the right candidate) will be considered. It could make the difference between your home being shown or not to the very family that would love to purchase it today! Don't forget to check out how a progressive marketing plan get's a home sold in the rough real estate market conditions that we are facing today! In the end, the experience and efforts of your realtor make all the difference. My mom just sold her home in CT after switching agents. The previous agents were "retired" and traveling all the time. The new agent sold the house within a month. A friend in Nutley, NJ sold his home after multiple bids and raved about the agent. "If a contract of sale is executed within 90 days after the termination of this agreement with any party identified on the list of prospective purchasers, then we shall be compensated hereunder, if, when, and as title passes." Is it true that if you hire another agent, that provision in the previous agreement with the previous agent is void? To answer your question as an absolute is not possible. Generally speaking, if using a Tallahassee Board of REALTORs listing agreement, you are correct. But each agency can utilize whichever agreement they want, and around the Country there must be thousands of different types of agreements. Seek legal counsel if you are facing this issue. Thanks Peggy. Your technique is smart, but it is sad that we have to do this. Most sellers just assume when they hire a real estate company, every effort is going to be made to sell the home. Rarely is that the case.